When British colonists arrived in Australia, they had little respect for the Aboriginal people, their artwork, way of life, or their languages. It has only been relatively recently (since the 1970’s) that Australian Aboriginal visual expression has been recognized as “Art”. In some parts of the world, there is still some resistance to the idea that this artistic expression is in fact “Art”. In today’s world, Indigenous Australian Art has at least become widely recognized as the oldest continuing artistic tradition in the world. There are many varied Aboriginal clans, tribes, languages, beliefs, and artistic traditions among these people. One common core concept binds all these groups together and that is a basic belief system. This has been translated into English as “The Dreaming” or “Dreamtime”. Dreamtime has a much more complicated special meaning and significance to Aboriginals than the English language is capable of explaining. In fact, the word “Dreaming” is a very poor, simplistic, and rough translation of a very complex concept (a more detailed explanation is attempted in the Packet information). At one level, Dreaming stories are creation stories. 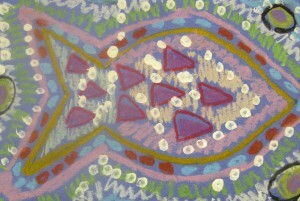 “Dreaming” also dictates the subject matter that aboriginal artists are permitted to paint under their law, and what subject matter is prohibited to them. Different Dreaming stories often relate to certain geographic areas of the Australian continent. Although ancient pallets were limited in color variety, the typical pattern possibilities of the art are amazing. PATTERN, LINE, SHAPE and COLOR are the major art topics for this month’s packet. Alchera, Altyerr, Ngarankarni, Tjukurpa, Jukurrpa, Walpiri: Various Aboriginal words (from different Aboriginal languages) for “the Dreamtime”, “Dreaming” or time during which they believe their world was created. There are about 250 separate Aboriginal languages and cultural groups in Australia, nearly all of which have different or slightly different words for the concept. Billabong: A waterhole in a dried-up riverbed. Bush: Country; place away from civilization. Corroboree: Clan gathering, a time for special songs, dances, body painting and ceremony. Djang: Special spiritual energy of the Ancestral beings that was left in sacred places. Uluru: An Aboriginal name for Ayers Rock, a major geographic formation of Australia, found standing alone in a flat, desert plain. The gigantic sandstone rock is Terra Cotta colored. Many caves, sacred to the Aboriginal population, are found here. There are special and often ancient rock paintings found on the walls and ceilings of these caves. 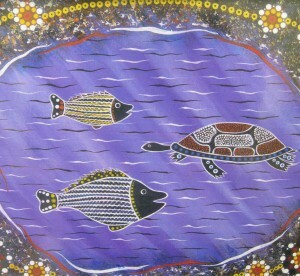 Walkabout: Ceremonial and spiritual journey honoring the Ancient Aboriginal Ancestors. Long before Europeans arrived in Australia, the Aborigines (Ab or ij in eez) had been living on the island continent for more than 40,000 years. Aboriginal Australians believe that, ancient years ago, waking time and sleeping time were the same thing. Then time split and waking time and sleeping time became separate. This moment is known by many titles including Alchera, Altyerr, Ngarankarni, Tjukurpa, Jukurrpa, each have the same meaning—the Dreaming or Dreamtime. There are hundreds of separate Aboriginal languages and cultural groups in Australia, nearly all of which have different or slightly different words for this concept. 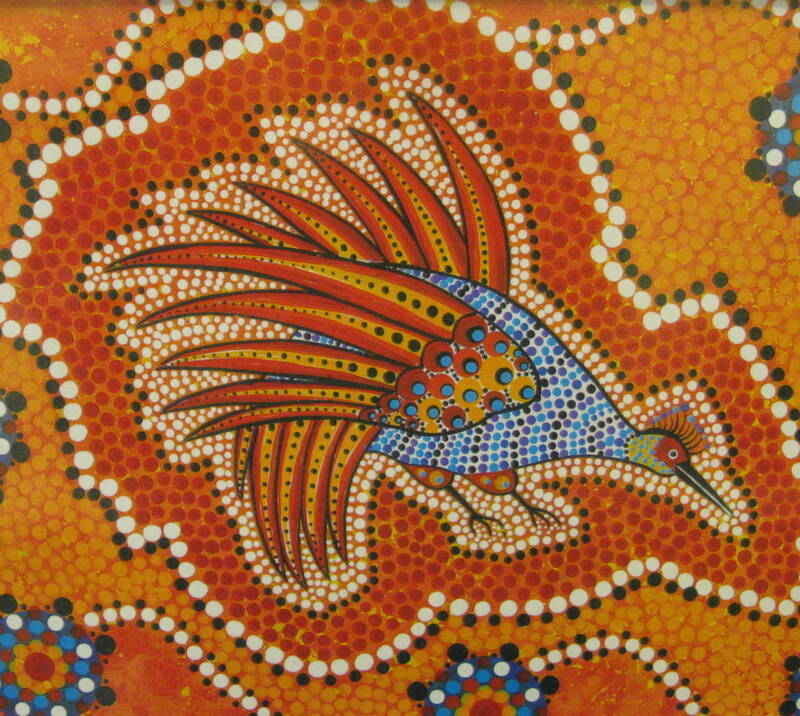 All Aboriginals have a basic belief in the Dreamtime, although various regions and tribes may also have distinctly separate myths and stories relating to it. In the Dreamtime, it is believed that Ancestral beings, who possessed both animal and human qualities, rose from where they were sleeping in the earth, and down from the sky, to walk across the empty land. As they walked, the Ancestors sang and the things they sang about suddenly appeared—rocks, rivers, lakes, oceans, hills, mountains, valleys, trees, forests, plants, animals, birds, insects, and all the people. It has long been believed that the Ancestors created the physical form of the earth and everything else, even boomerangs and spears. It is also believed that these Ancestors taught the Aborigines how to live and survive, along with the customs and rules for correct human behavior. After the Ancestors had finished their work, they went back into the earth, or up to the sky, to sleep. From the Ancestors and from this time, ceremonies and rituals began. The Ancestors were the source of the songs, dances, and designs used in the sacred ceremonies or rituals that are the basis of Aboriginal religious expression, which continue to this day in many areas. In many places special to the Aborigines, they believe the Ancestors left their special energy (djang). Through particular ceremonies and rituals, Australian Aboriginals traditionally believed they could connect with these Ancestors and share this special energy. They sing songs, dance and create paintings—in the sand, on rocks, even on their bodies—to preserve and celebrate the memory of the Dreamtime, when the landscape they live in was given its shape. To the Aborigines, the Dreaming is also the place of their Ancestors—their thoughts, their past and the place humans go to when their brief time in this life has ended—the afterlife. Because of this, they tell of the Dreaming in stories that are handed down to their children. These stories may be in the form of a history of their culture and people, or as a teaching aid. Every Australian Aborigine belongs to a clan—a large family group. A particular Ancestor is believed to have founded each clan and the clan is named after the thing its Ancestor created. A person’s clan name might be Honey-ant, Wichetty-Grub, Flying Fox, or Emu, depending on the ancestor stories. Each clan name is either a native creature or a natural landmark found in Australia. In the past, when the Aborigines hunted for food, they were allowed to hunt for anything except the thing that their Ancestor created and for which their clan was named. Whenever they can, the members of every clan gather for a ceremony, or a Corroboree—a kind of party. They sing the Ancestor’s song, perform special dances and create ceremonial paintings on their bodies, on rocks, or bark, even on the ground, to make sure that the thing their clans are named for will be born again. They believe that if they do not sing these songs and perform special rituals, then the thing their clan represents will die and so will the clan. At the Corroboree ceremony, the men paint their faces and bodies with colorful patterns. They act out the story of their Ancestor and draw it in the sand. Aboriginal children learn the special songs of the Ancestors at these ceremonies, which have been repeated for thousands of generations, so that the clan traditions and stories would continue. Aborigines had no written language until recently, so there was no other way to record special knowledge except by teaching it to the children of each generation. It is believed that when the Ancestors left the Earth, they became stars or the moon, disappeared into water holes and caves, or transformed their bodies into rocks and boulders. Aborigines believe the Ancestors’ remains can be seen and are present in natural landscapes everywhere on their earth today. They also believe that people are part mortal and part spiritual. Some believe that when a person dies, his or her spiritual part returns to the land and creates a child spirit. When a woman is ready to have a baby, these Aborigines believe she receives a child spirit given to her from the land. These people traditionally led a very simple life, with few material possessions, because their relationship with the earth is a system of give and take. They felt that the less they took from the earth, the less they were required to return. Together Aboriginals believed that plants, animals and all natural elements of the earth were just as important as human beings. They believed that they should be careful of the things the Ancestors had left for them on the earth—water, animals and plants. They believe that everything needs to be balanced between humans and nature. If too much is taken and not respected, the balance of everything will be destroyed. 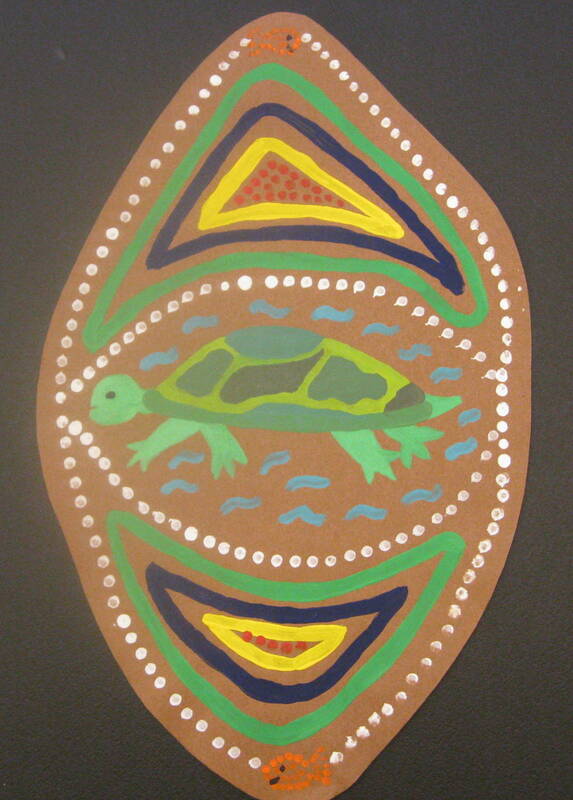 There are stories depicted in Aboriginal art, either found on a rock face, tree bark, or most recently, on canvas. These painted stories may be of a personal nature, like a past experience, an historic event, or even a territorial war. Rock paintings that have survived weather erosion were first painted thousands of years ago, and in some cases, appear as clear today as the day the original artists painted them. Each generation of a clan cares for the special paintings and repaints them in important ceremonies. 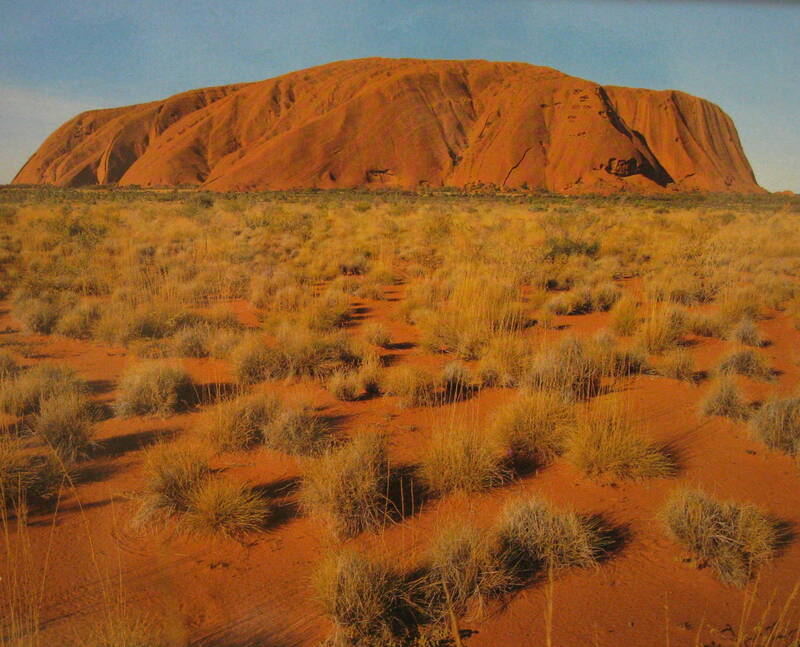 Ayers Rock (Uluru), a gigantic terra cotta colored rock in Australia, is an example of a place filled with the ancestral energy, or djang. This sandstone rock has an air of mystery because it rises over 2,845 feet, standing all by itself in the middle of a flat and desert plain. The top of Ayers Rock is almost flat. There are important rock paintings found here and some are more than 10,000 years old. The paintings are in an area reserved exclusively for the native people. Tourists and photographers are not allowed to enter the caves and rock overhangs that protect them. 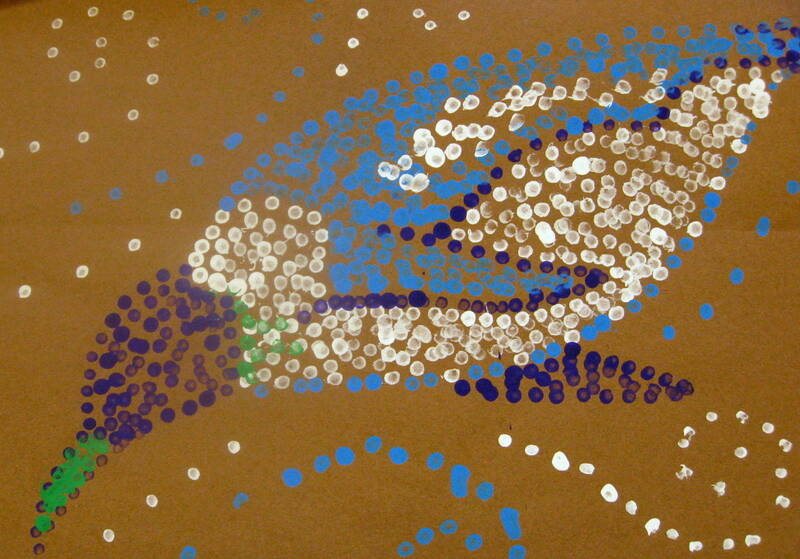 In the past, Aboriginal artists were hunter-gatherers, moving from place to place according to the seasons. When English settlers arrived in Australia, in the 18th century, they took over the land and tried to make Aboriginals live in towns. Like other native peoples around the world, the Aborigines found it harder and harder to follow their traditional cultural way of life. The Aborigines’ way of life is changing and disappearing. They now live mostly in cities or on reserves. Some continue to keep their traditional customs and still follow the legends of their Ancestors. Many clans have lost and forgotten their traditions because the children have not learned them. The younger generations have tended to move away from the culture of their ancestors and become part of the modern world. 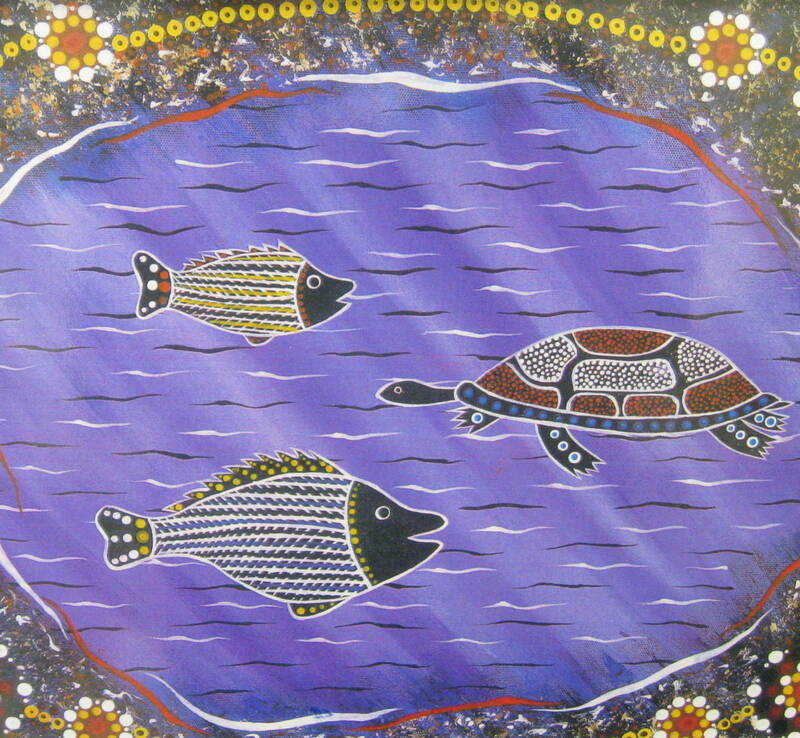 In the 1970’s, Aboriginal artists realized that if they painted more permanent, lasting versions of dreaming pictures on bark or canvas, they could sell them and raise money for their people who are still trying to live and keep the traditional ways of the ancient generations who came before them. These modern paintings for tourists show only pieces of sacred legends that Aboriginals feel is safe for outsiders to know. This is how the pictures painted by Aboriginal artists like C. Dan Purches, whose true tribal name is Naiura, help keep alive the memory of Dreamtime, and traditional Aboriginal culture. Before the European invasion in 1788, there were between 600 and 700 distinct “tribes” across the continent of Australia. Each had its own territory, its own political system and laws, and its own language—just like the nations of Europe, only smaller in scale. The label of “tribe” was a title imposed on the Aboriginals by the British invaders, who took over land that many had been living on for hundreds of generations. As British settlements grew, they needed a way to administer their provinces. They lumped language groups, or nearby groups of aboriginal villages, under one tribal name, although some of the groups often had major cultural or language differences. 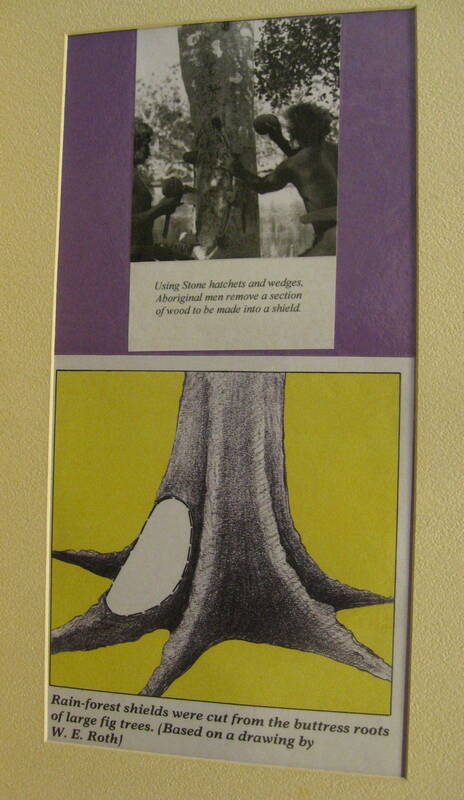 Aboriginals had always referred to themselves by the names given to their clans by their “Dreaming” Ancestors. Sometimes the language of one country is somewhat understood by peoples of the next nation, or their founding nation, such as the way an American, Irishman, Scotsman and a Londoner’s languages are different dialects of English. This is what sometimes occurred across the continent of Australia before Europeans came. Neighboring tribes may not have spoken each other’s language fluently, but each understood enough of the other’s words to pick up the general sense of what was being said. Sometimes two or three—or even five or six—adjacent tribes spoke what were really dialects of one language. At other times, a single tribe spoke its own language, different from the languages of neighboring groups. Between them, the original 600 to 700 tribe-nations of Australia spoke 200 to 250 different languages. These were each separate languages, as distinct from each other as French and German, or Chinese and English. Sharing one language gave all members of a tribe-nation a sense of community in the same way that residents of Greece feel themselves to be one nation because everyone speaks Greek. Each Australian tribe-nation was/is proud of its language and identifies with it in the same way. Some of the original Aboriginal languages have unfortunately been lost today because of grouping various clans and tribes together. Eventually, those outnumbered in a group had no one left to pass on their own unique language to before they died. In 1768, Captain Cook was appointed to command the Endeavor on a sailing expedition to Tahiti. Several scientists accompanied him on the journey. 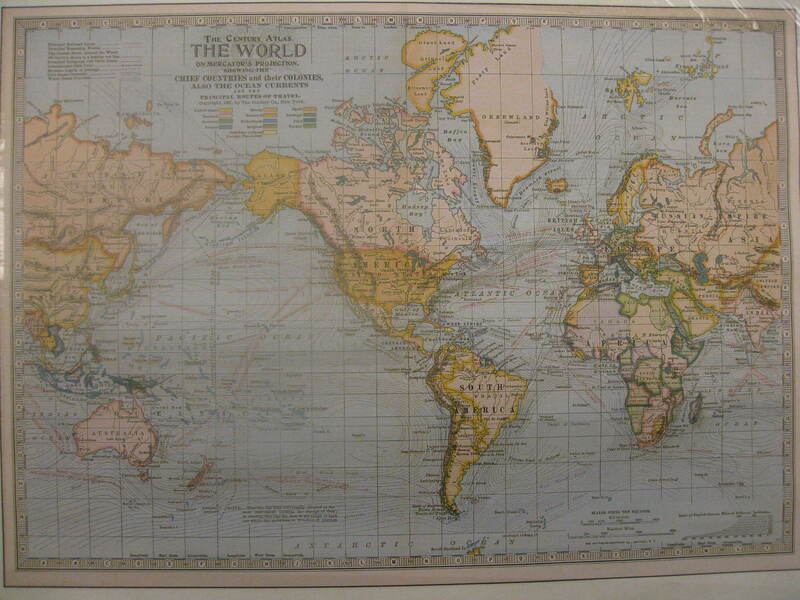 Cook’s secret orders were to find Terra Australis an unknown and never before seen continent. At the time, scientists speculated that there must be a large continent in the Southern Hemisphere to balance the weight of all the other continents in the known Northern Hemisphere. 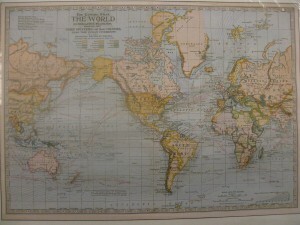 Cook discovered and sailed around New Zealand and charted the first accurate maps of these islands, just north of Australia. In 1771, his ship was damaged on Australia’s Great Barrier Reef. He landed on the continent of Australia at the Endeavor River, in Botany Bay, to make repairs. 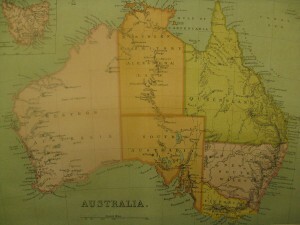 Cook claimed the land of Australia for Great Britain and had no way of knowing at the time, just how large Australia really was. It is interesting the way many early explorers claimed the countries that they had discovered for the first time, although other people were already living there. Australian Aboriginal had already been living on the island continent of Australia for more than 20,000 to 60,000 years before Cook ever landed there. Unfortunately, the British felt it was their right to take over the continent and destroyed many native people and their native homelands as they did it. 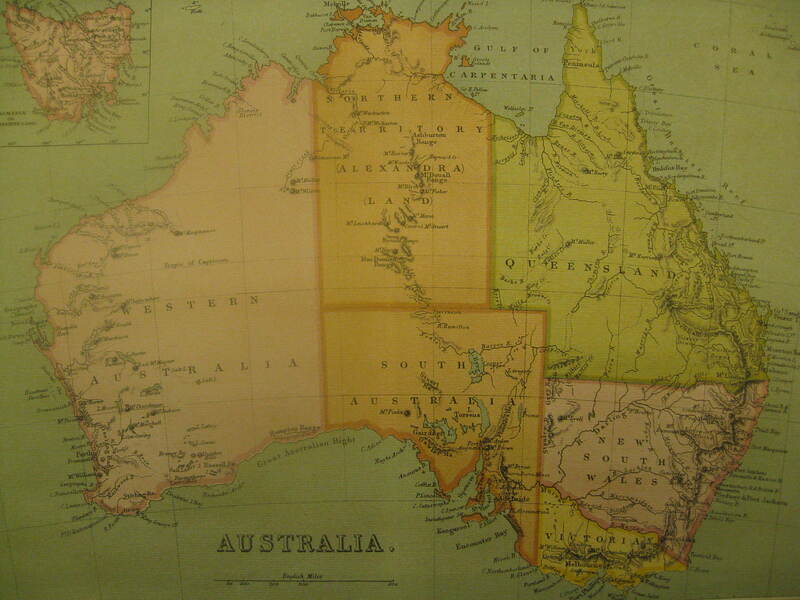 England originally designated Australia as a colony of convicts. The British had a problem with overcrowding in their prisons and at the same time, they needed settlers to establish new colonies in Australia. The British tried to combine the answer to both problems by using the prisoners to build a new civilization in wild Australia. The first British Fleet arrived at what is now the city of Sydney, in 1788. On board were 736 convicts and 280 guards who began building the first convict colony. It was not easy for Europeans when they first came to Australia, conditions were extremely harsh, and many died. Aboriginal culture was very different from European culture. Aboriginal people were hunter-gatherers who hunted and collected foods in season within their own territories. Their religion, kinship systems, and social organization were very complex and different than other cultures. 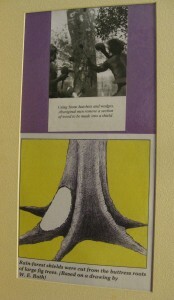 Central to their culture was their relationship with the land through “the dreaming”. Europeans took little time to notice the way of life of these native Australians. They simply tried to move them out of the way to take over this new land with cities and ranches. Today, the original aboriginal ancestors of the first Australians are a small percentage of Australia’s mostly European ancestor population. As often as possible, the “tribal” names and/or locations of the origin of the art have been listed, except their correct pronunciations are not included. (Your guess is as good as mine.) The story samplings included are from more than one “tribe”. Each group has their own explanations for the nature of their environment and their traditional stories vary greatly, as do their traditions. Understand that there are many types and styles of Art to be found among these very first inhabitants of Australia. The art of the packet exemplifies only some of the typical artistic traits that can be seen in this art. Known as C. Dan Purches to the outside world, the artist’s tribal name is Naiura. C. Dan learned his art from his mother, who also spent many hours telling her son stories that were handed down from her ancestors. Originally, Aborigines had nothing written. Today, many traditional stories, handed down for thousands of years, have been gathered and written down so that they will not be forgotten. Paintings were originally created only as a way to remind ancient Aborigines of the special stories of their ancestors and, except for the ones protected in caves, were not permanent. Modern day Aboriginal painters, such as C. Dan Purches, still paint these same stories. It is important to many that the traditional painting of the stories not be forgotten. These paintings have changed some with the use of modern day, bright colored acrylic paints. Originally, paintings could only be created from natural clays, or charcoal. These colors consisted mostly of only terra cotta red, white, black and some browns. Besides the use of modern acrylic colors, the paintings that the modern world is allowed to see are slightly different from the ones created in special tribal ceremonies. But the same techniques of dot and/or line patterns are still used. C. Dan’s maternal grandfather was a member of the Burramadagal clan of the Dharrug tribe. His people frequented the Parramatta River area of New South Wales, Australia. The platypus (known as gaya dari to some Aboriginal tribes) is one of the most unusual mammals in the world. It lives along rivers only in certain areas of Australia. When news of the platypus first reached Europeans, scientists there were convinced such an animal could not exist. When the first Europeans saw the platypus for the first time, they were convinced that someone had artificially sewn its duckbilled mouth, flippers and flat tail together. They even took a platypus back to Britain for scientists to examine and discover exactly how this “hoax” had been created. When it was determined to be a real species of animal, the platypus challenged all the known laws of animal classification. The platypus is considered vulnerable and rare today because it now has a low population and its environment is threatened. This mammal is sensitive to the water pollution in its river habitat. Pollution also kills the crustaceans that supply the platypus with food. Australia’s modern day industries have affected water pollution in the environment, just like pollution problems here in America. Another threat to the platypus is the increase in human population. Although Australia’s population is still relatively small compared to other areas of the world, it has been experiencing high immigration rates ever since WWII. Ninety percent of Australia’s modern population lives in cities along the coast. These Australian cities have been experiencing suburban sprawl. This means that much of the best land is being cleared for housing. This increased land use places additional pressure on the natural environment. In short, the threat to the platypus represents the conflict between modern industry and ecology. The platypus pictured here is swimming in a Billabong, which is a waterhole in a dried-up riverbed. During the summer, many riverbeds completely dry, up except in the deepest areas of the river. During Australia’s fall and winter (our spring and summer), the rain falls and the rivers run again until summer (winter here). Dried up riverbeds are part of the seasonal cycle of this mostly dry, desert continent. What COLORS can you find in the picture? What type of PATTERN can you see decorating the platypus? The body and flippers are outlined with an ALTERNATING red and white dot pattern, the tail, neck and bill with a REPEATING yellow dot pattern. Rounded SHAPES on the tail, body, and bill are filled in with a similar LINE pattern. Short, diagonal LINES cross over the straight white LINES in an ALTERNATING LINE pattern, slightly different on the body than the areas of the tail and bill. Different LINE QUALITY (red on the bill and tail, brown on the body) slightly changes the three white LINE patterns found on the different areas of the platypus. What other basic LINE TYPE can you see other than the short, white diagonal lines? Curved, and the platypus itself is set in a diagonal position. Where do you see CURVED LINES? The red and white wave lines on the water, the thick green line that outlines the water, the “points” (dots) also create curved line where they outline the water with red and black, various parts of the platypus, and the outside edges of the picture. An artistic word for dots is “points”. Where else can you find POINTS in this picture? On the leaves (or petals) surrounding the billabong there are yellow and red points, the red and black points that create outlines outside the water SHAPE, outlining different areas of the platypus SHAPE, the eight CONCENTRIC CIRCLES are created with various sizes and colors of dots. A concentric circle is a ring of circles within a circle, like a target. Do all of the POINTS in this picture create a LINE PATTERN? No, a RANDOM pattern of white dots 9points) on a yellow background can be seen on the farthest outside edges of the picture. In the Dreamtime, before tribal laws were established, the people wandered wherever they wished and took whatever the land offered. Unfortunately, this often caused problems; especially with tribes that had occupied an area for a long time, because as far as they were concerned, their years of settlement entitled them to claim the land and all it contained. This also occurred with neighboring tribes but groups usually came to peaceful mutual agreements on tribal boundaries. Problems arose after some of the larger tribes ignored recognized boundaries and hunted, or removed sticks for spears (plants were not plentiful in many areas of this mostly dry, hot continent), or clay for ceremonial adornment (used to paint ceremonial symbols and patterns on their bodies). Physical confrontation usually followed this disrespect for the rights of tribal boundaries for smaller clans. Baiame, the Great Spirit, realized that something had to be done to bring order to the land and avoid more serious consequences, so he created a large billabong in the middle of a stand of gum trees, situated on the claimed boundaries of several tribes. Then the Great Sprit called all the tribes together to meet at the billabong. The Great Spirit never appeared as himself, because to reveal himself in all his glory would most certainly destroy all those who saw him, so he always appeared in the form of an animal. For this meeting, the Great Spirit appeared in the form of gaya dari, or platypus. After the tribes had set up their camps at the billabong, the Great Spirit revealed himself. He rose to the surface and began allotting each tribe a certain area of land to be theirs alone. Any tribe trespassing upon another tribe’s land would be in violation of this law and would suffer the consequences. From this time on, the tribes could rightfully claim their land, and deal with any trespassers without fear of offending the spirits. Many Aboriginal tribes, or clans, established their own seasonal cycles, following a short traditional migration through their tribal land boundaries, established generations and generations before. The clan’s movement assured each tribe of the best seasonal places to find water and food. When summer came and rivers dried up, each tribe knew where in their tribal land natural springs and watering holes, or billabongs, could be located. 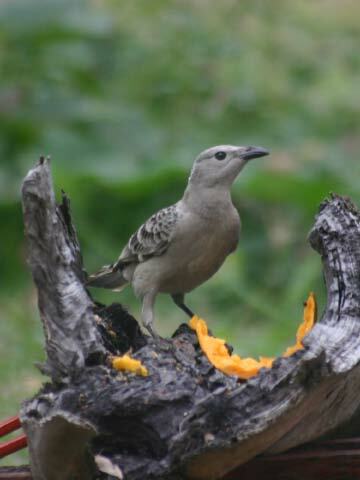 The best places to find food such as wild game, termites, honey ants, witchetty grubs, alligator eggs, or to dig wild yams and find wild fruit, were passed on from generation to generation. By moving through their tribal lands, each clan kept a balance of what nature had provided them, without overusing and depleting these natural resources. For thousands of years, this seasonal cycle was faithfully repeated, in order for the tribe to survive in its healthiest state, and to ensure that the scant resources of the land would endure. What COLORS did the artist use to paint the water in this picture? The waves are painted with white and black curved lines. The color of the water is violet or purple. The water painted here is not a solid color like the blue water in the platypus painting. There are diagonal streaks of a lighter purple TINT across the water. How are TINTS created? Color is added to white, the more color, the darker the VALUE, the less color, the lighter the VALUE. Is the PATTERN the same on the fish as on the turtle? Besides the different colors of solid lines between the lines decorated with short, diagonal lines, they appear very similar. There is a major difference though. ON THE TWO FISH, THE SHORT DIAGONAL LINES CHANGE DIRECTION ON THE UPPER AND LOWER AREAS OF THEIR BODIES. 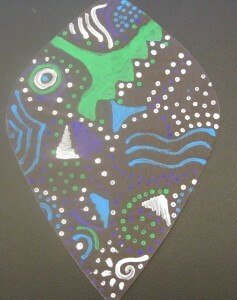 On a piece of black construction paper, draw a large fish or turtle shape that fills most of the page. Outline this shape with white paint. Use a choice of various colors to create a decorative PATTERN on the fish or turtle. Create the pattern using only LINES and/or POINTS (dots). Outline the eye with white paint to finish your fish or turtle. Do the same project listed above using a different colored, or white paper. If you use white, the contour lines (outlines) should be black. On DARKER VALUE colors (such as violet), white contour lines (outlines) will CONTRAST the best. On LIGHTER VALUE colored background paper (yellow for instance), black contour lines (outlines) will have the best contrast. If you aren’t sure which contour line color (black or white) to use on the color of paper you have chosen, paint two small lines on the back of your drawing to see which has the most contrast to make your fish or turtle stand out the best. Paint a line pattern and a point (dot) pattern on a ¼ sheet of colored, black, or white paper. Fill the entire piece of paper, from top to bottom and edge to edge. After the sheets are dry, cut out fish, turtle, platypus, or kangaroo shapes from the painted pattern sheets. Glue the shape(s) to a solid color, CONTRASTING background (a different color than the ¼ sheets). Use either black or white to paint contour lines (outlines) around the shapes after they have been glued on the background. Fill a black piece of paper with an abstract pattern of CONCENTRIC CIRCLES created with various COLORED patterns of points. Refer to the three pictures painted by C. Dan Purches (Naiura) for inspiration. Wayambah’s tribe (clan) had settled the area around the billabong long before he was born, so he and his two younger brothers were well acquainted with the dangers there. One of the most serious dangers of the billabong was the mass of tangled weeds to be found under the water’s surface. In spite of their parents’ warnings not to go to the billabong alone, the three boys constantly disobeyed. Their parents often punished them for disobeying because the sons needed to learn to respect what their parents tried to teach them; they also wanted to keep their sons safe. But the punishment did not have much affect on the naughty boys and they continued to disobey their parent’s stern warnings. The boy’s father admired their active spirit but he could not allow them to continually show such disrespect. Their father knew punishment was not the answer but he could think of nothing that would solve the problem. One night, while their father was sleeping, a spirit visited him. This spirit told the father to make his sons a canoe. “You mean that I should reward them for their disobedience?” he asked the spirit. ”Make them a canoe,” the spirit repeated. “It is the only way to solve your problem”. The next day the boy’s father cut bark from a tree and built a canoe as the spirit had instructed him. Then the father gave the canoe to Wayambah. He told him that when he returned from a hunt he would take Wayambah and his brothers to the billabong and teach them how to use the canoe. Sadly, Wayambah was far too impatient to wait for his father, so he lifted the canoe onto his back and called his brothers to follow him to the billabong. When the boys arrived there, Wayambah tried to lower the canoe into the water, but it was stuck fast to his back and was as hard as a rock. Slowly, Wayambah sank to his hands and knees under the weight of the heavy canoe and turned into a strange looking creature, who suddenly toppled into the billabong. When the two brothers saw what happened, they entered the water to help Wayambah and were turned into fish. And that is how the Wayambah, or Turtle, was created. In many areas of Australia, hunting and fighting weapons were interchangeable. In other areas, specialized weapons were created. The basic weapon was a club. These varied from simple lengths of hardwood chopped from any convenient tree, to ornately carved and balanced works of art. 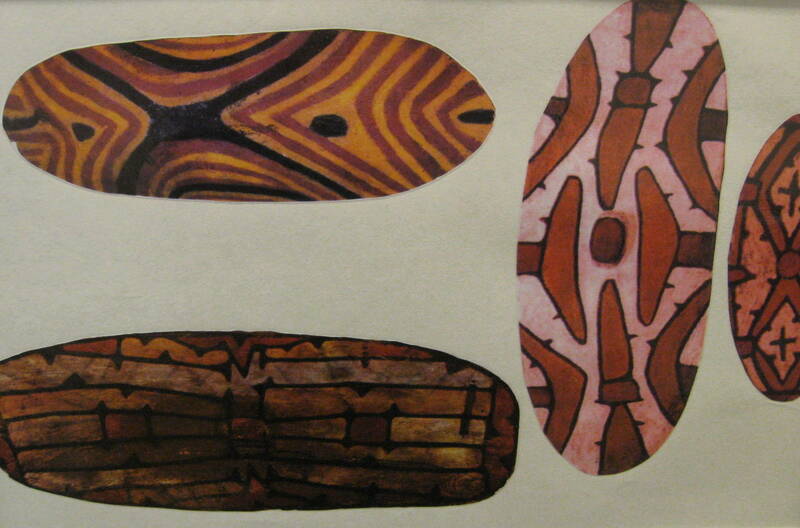 Shields were once used as protective devices in many, but not all areas, of aboriginal Australia. Made of hardwood and softwood (depending on the region where they were created), shields were used to stop clubs. The people of the rainforest areas of Queensland made Australia’s largest shields. Rainforest shields were carefully carved from the buttress roots of large fig trees and beautifully decorated with clan designs. The shields appear much smaller than their actual size here. The largest shield, seen on the top left, actually measures 46” tall and 16 ½” wide. This shield comes from the Cape York region of Queensland, Australia and is at least 100 years old. The two shields below this one are also rain-forest shields, from the Cairns area of Queensland. The larger shields were both used for functional defense. The smaller shield was made only for special ceremonial purposes. 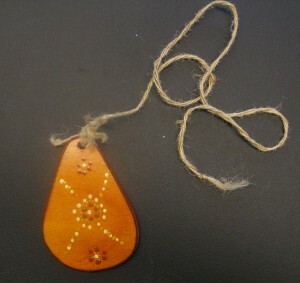 In Central Australia and surrounding areas, softwood shields were used for protection in times of conflict. The shield on the upper right was carved from bean-tree wood, around 1890, from the Copper Creek Area of South Australia. This type of shield served more than one purpose. The hollowed-out handle on the back of the shield created a cavity, similar to a small bowl, which was used for preparing ochres for painting. The curved outer surface of a shield could also be used for lighting fires in the ancient sawing method. Shields could additionally be painted with appropriate meaningful designs and transformed into an important ceremonial object. The most interesting thing to see on the shields is their artistic painted patterns. Each shield is painted with bold totemic designs related to the owner. The shields are now housed in Australian Museums and no longer used. Which shield PATTERN do you like the best? Cut large oval shapes (16” – 24”) from corrugated cardboard (to resemble carved wood). Use natural colors (red, brown, black and white) to create a shield design over the entire oval that is uniquely your own. An optional handle could be glued or taped to the back. 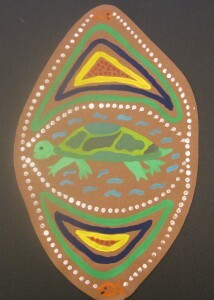 Paint a shield design on an oval drawn on brown, 12” x 18” construction paper. Cut out and mount of white paper. One day a Lizard (Oolah) woman was out gathering tucker (food). She carried her *digging stick and her gathering basket with her. Suddenly she heard a noise and stopped to listen. Out jumped Wayambah, who grabbed her. She tried to fight him off but only had a digging stick and Wayambah had spears. He carried the Oolah woman off to his camp, where the elders asked Wayambah if the woman had been given to him from the Oolah clan. He replied that he had stolen her. The elders warned Wayambah that the Oolahs would soon come after the woman and that he had no right to make the Oolahs angry with them all. The elders told Wayambah that it was his responsibility alone to make things right. Soon the Oolahs came across the countryside toward Wayambah’s camp, looking for the Oolah woman. They were painted with symbols of war and carried no boughs of peace. Knowing that he had to face them alone, Wayambah chose his two largest boreens (shields) and slung one on his back and the other over his chest. He then grabbed his weapons and went out to meet the Oolahs. This aggravated the Oolahs, who took more careful aim and again threw spears and boomerangs. Wayambah simply drew his arms and head inside his boreens as the weapons fell harmlessly around him. For a long time the Oolahs threw their weapons, as they moved closer and closer, backing Wayambah into the billabong. They were so close that Wayambah’s only chance was to dive into the billabong and try to hide. Once he went into the water, the Oolahs gathered around the edges of the billabong with their weapons poised, waiting for Wayambah to come up for air. They waited and waited but Wayambah never appeared above the water and was never seen again. However, a new and unique creature was later seen living in the billabong. It had a hard shell on its front and back and every time the new creature sensed danger, it drew its head and legs inside the shell and disappeared under the water. People often wondered if Wayambah had turned into this new creature, but they never knew for sure. The universal tool and probably the most important one throughout Australia was the digging stick. These were used and prized by women. Digging sticks were carefully designed simple hardwood poles of varying lengths with either a spatula type chisel-shaped end, or a pointed end. With digging sticks, women and children collected about 85 percent of the clan’s food. The tool was useful in collecting edible tubers and roots (wild yams and onions), digging out small animals and reptiles from burrows, and opening termite mounds or honey-ant nests. They were also useful for stripping bark from trees and digging earth ovens. In some coastal areas, digging sticks were also used to collect shellfish and spear fish trapped at low tide in rock holes. The Weedah, or Bower Bird, is a plain looking brown bird of Australia. To court a female, male birds build an intricate nest that resembles a small bower or thickly woven arch. 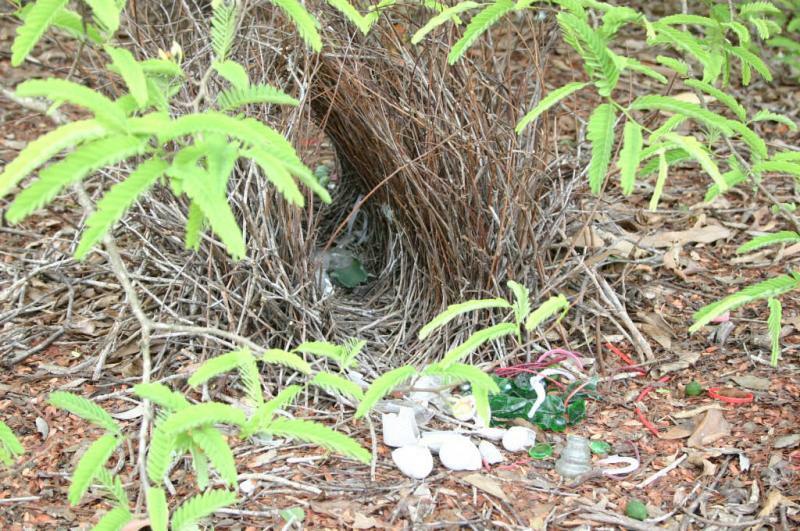 Collecting small sticks and working for 4-5 hours each day, it takes a Bower Bird about two weeks to construct his bower. But he needs to impress a female to join him in his nest, so sticks are not the only material that he uses. He collects shiny pieces of glass, even colorful plastic or metal trash, shells, or bleached bones to weave among the sticks that form his intricately decorated bower. 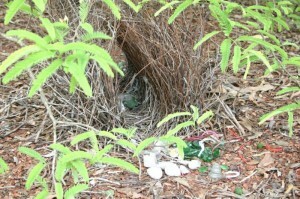 Female Bower Birds are attracted to the fanciest nest. The male bird also has colorful, hidden feathers on the back of his head that he “puffs up” on top of his head to impress the female as she inspects the bower. Once the eggs are laid, females leave the nest and the male bird hatches and raises the young by himself. Why might the story of a colorful Bower Bird have been created? 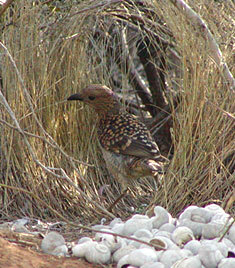 The Bower Bird is naturally a dull brown color, except for the few special feathers hidden on the back of his head. Because the bird loves to decorate his nest with shiny and colorful objects, the story seems to fit the colorful habits and personality of the plain brown bird. What COLORS did the artist use to paint this picture? Who can list ALL of the pairs of complementary colors? This painting has some CONCENTRIC CIRCLES, just like the other two pictures created by this artist. All three of the pictures have points (dots). This picture is a little different from the other two paintings. 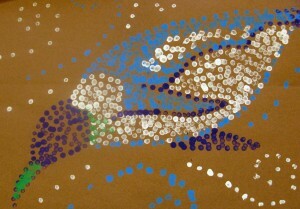 Although it has LINES, (outlining the bird, its feathers and its headdress) the lines are only contour lines (outlines). None of the PATTERNS in this picture were created with LINE, like the other two pictures. Every pattern in this painting is created with points (dots). The CONCENTRIC SHAPES of the bird can be seen repeated in the rings of white, black and red dot (point) patterns that surround the painted bird. Draw a simple emu, lizard, alligator or snake shape. Trace this shape in the center of your paper. 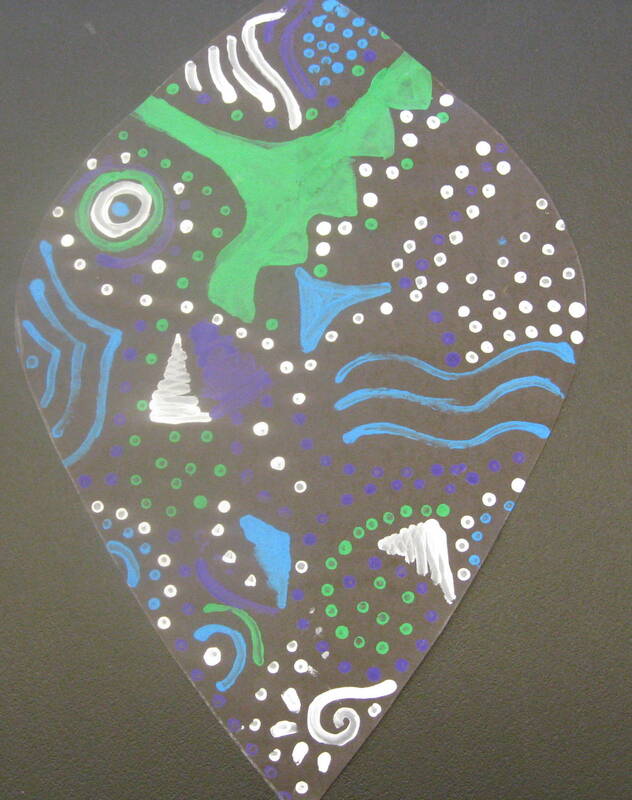 Paint the shape will colorful point patterns, created by using the eraser end of a pencil. Repeat the shape with CONCENTRIC SHAPE rings of different colored point patterns outlining the shape. Add some colorful CONCENTRIC CIRCLES, similar to this painting. There was once a tribe that occupied a beautiful and fertile land with plenty of water, good hunting, and an abundance of reeds, rushes, and long sticks with which to make baskets and spears. Because of all this, they should have been a happy and contented people. Sadly, that was not so, because each family had isolated itself from the other families and seldom spoke except to argue and quarrel over the most trivial and unimportant matters. The spirits were aware of this and hoped that in time the people would realize the foolishness of their ways and begin to behave as other tribes, but this never happened. Baiame, The Great Spirit, was both disappointed and angry with the ungrateful people because he had provided all that a people should need in order to live a healthy and happy life, so he decided to punish them. One day when the people were shouting insults at each other Baiame sent a spirit in the form of a Weedah, or a bower bird, to deliver his message. First, the bird circled the separate camps dotted about the land, calling the people together. They were so amazed by a bird that spoke their language in such a clear, powerful voice that they obeyed immediately. When the people were assembled, the bird continued circling them, absorbing the color from the land into its own body until the once lush land was nothing more than dry, sandy desert. The people stared in disbelief at the bird, which had now become a Koninderie Weedah, or rainbow bower bird. Then the beautiful creature circled once more, and disappeared. 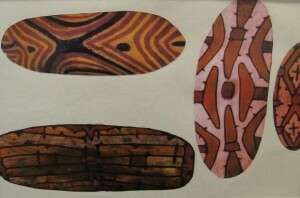 Rock paintings are still very important to aboriginal people, in many different ways. Originally, each site belonged to a particular group, which had the right of access and the responsibility for looking after the paintings or engravings and for any necessary ceremonies. Many religious images were more than just pictures. They also represented the actual spiritual energy of the creative ancestors and when repainted or retouched in a special ritual, aborigines felt their sacred power was released, insuring that the seasons came at their proper time, plants and animals were in plentiful supply, and children would be born. The Warlpiri and Pitjantijatjara people of the deserts still retouch important rock images for specific rituals. The rock paintings demonstrate group ownership of sites and country, Aboriginal connections to their land. The stories they represent have been handed down from father to son for many, many generations. Even where images are no longer painted or repainted, they can still be very important to aboriginal people who know the stories and meanings associated with them. The painted images are regarded as a major link with the past, a part of Aboriginal heritage, a record of Aboriginal history, and a source of identity to present generations of Aboriginal people. In many parts of Australia, however, the history of the last 200 years has meant the loss of land and of traditional practices. Still, the rock paintings and engravings found in areas now taken over by European Australian ranchers, no longer “home” to tribes that once lived there, have great symbolic significance to all aboriginal communities. 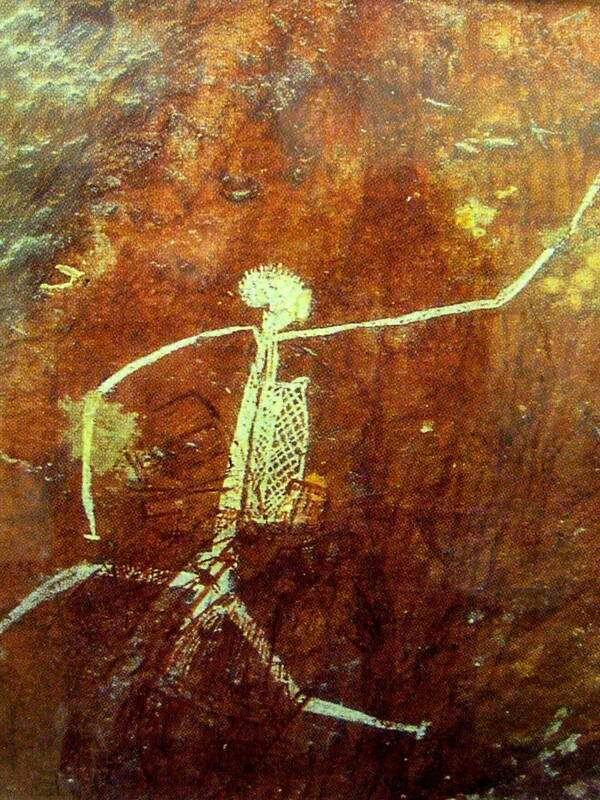 Some of the rock paintings show events or activities common in the Aboriginal community. Other pictures were painted for religious purposes, to obtain blessings for the group or tribe. Most of these paintings are in shades of ochre and are very well preserved, since the native people themselves have been in charge of taking care of them. Common rock art subjects include kangaroos, turtles, snakes, fish, and other “spirit” beings that certain groups recognize as their “dreaming” ancestors. This rock painting, done with paint made from white clay, pictures a special mythical creature called a “Mimi”. Often these creatures are painted with red clay. Mimis are said to live in the nooks and crannies of the rocky Australian landscape, coming out only at night. They are said to be so thin and frail that they can only emerge from their hiding places when there is no wind; otherwise, they would be blown away. For some tribes or clans, Mimis are the “Dreaming” ancestors who taught their people to paint, hunt, dance and compose songs. Mimi paintings show elegant, graceful, stick-like human figures in action—fighting, running, dancing, leaping and hunting. In some legends, Mimis would lure humans into caves and hold them captive. Some tribes believe that Mimis themselves created these lively self-portrait paintings, which the people believe are the actual ancestral beings, not just paintings of them. Only the Mimi painted in rock art are believed to be the actual spirits themselves. 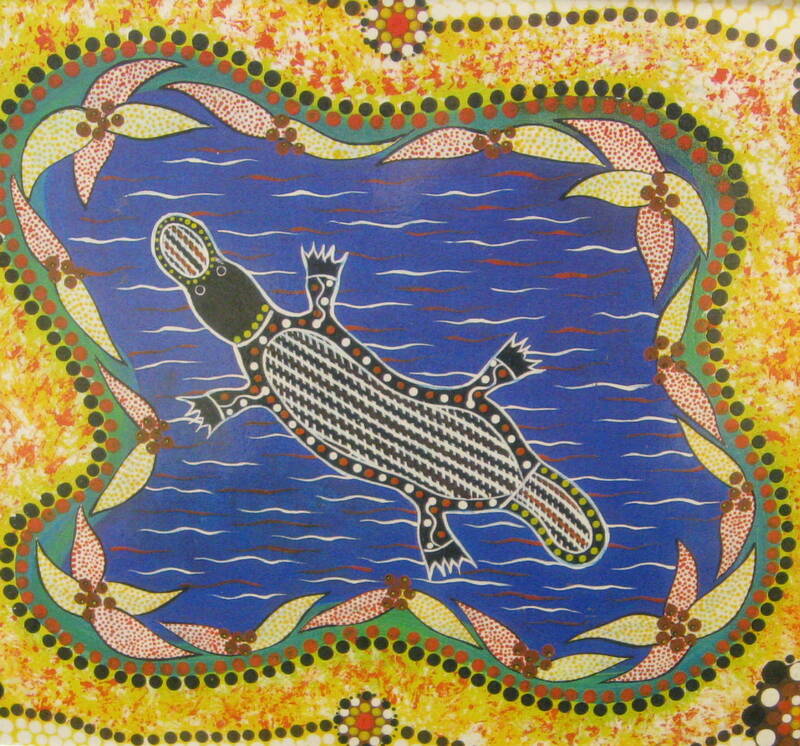 Many aboriginal artists paint Mimi figures on bark, or in other pictures sold to the public as T-shirt decorations or canvas paintings. Sometimes Mimis are painted showing more detail, or as male and female. Mimis are always pictured as having extremely long, thin arms and legs, and long necks, with small heads. Sometimes they are painted with open mouths. In bark paintings, a male Mimi is occasionally painted with small clusters of short, diagonal lines projecting from his knees and ankles. These represent feathers. Sometimes the bodies of Mimis are wider than the arms and legs and filled in with geometric PATTERN associated with a particular clan. Mimi’s are also sometimes painted with long fingers and toes, along with knobby knees. Using white paint, create a simple line Mimi (or two) on brown or gray paper, in an action pose, showing it (them) fighting, running, dancing, leaping, or hunting. Use white or red paint to paint a Mimi on a flat river rock or a natural color tile that has a no gloss finish. Use white glue and yarn to create a Mimi LINE figure on construction paper or cardboard. The yarn can be in natural colors or any bright color you prefer. Draw a long, thin, rectangle SHAPE. Cut and attach a small Mimi head and long, skinny arms and legs, using the rectangle for the body. Create geometric and/or line patterns inside the rectangle. Do not create the same type of pattern as others because the one you create will represent your own clan or family. 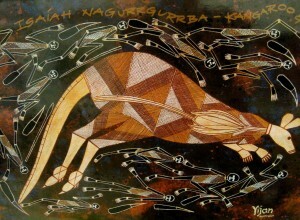 The style of art the kangaroo is painted in is called “x-ray painting”. How do you think the name for this style of painting evolved? The style shows the “insides” or the organs of an animal as part of the pattern and decoration of the shape. Sometimes the animal’s bones are painted too. What type of LINE can you see? How did the artist create a feeling of MOVEMENT? The Mimis seem to circle around the Kangaroo. Their arms and legs are bent in different ways to create a feeling of movement. Some Mimi are also turned at slightly different angles, which helps them appear to be floating in space around the kangaroo. Maybe there is a wind blowing them! Use white and colored chalk on black paper to draw a Mimi in an “action” pose. Be sure to add a cross-hatched design on the body. Use oil pastels on black paper to do the project above. Draw the outline shape of a kangaroo or another Australian animal in the center of a piece of paper. Use a ruler to draw white, brown and red lines to create an x-ray, cross-hatched style of pattern inside the animal shape. Before creating the type of project above, use a toothbrush and thinned paint to create a textured pattern on your background paper. Set a large area of newspaper under the paper you are painting. Examine this picture’s background closely for inspiration and paint color ideas. Bobbi-bobbi sent some flying foxes to men for them to eat. They were not really foxes, but fruit-eating bats that had faces like foxes. But the flying foxes flew too high for the men to catch. When Bobbi-bobbi saw this, he reached into his own body and pulled out one of his ribs. Then, this snake spirit tossed his rib down to the men and said, “Here, use this to catch creatures that fly. Throw this into the air and it comes back to you.” Bobbi-bobbi’s rib became the first boomerang, which is not only used for hunting but is also a very dangerous fighting weapon. This boomerang was carved and painted by a modern Aborigine, for selling to Australian tourists. Instead of using original organic materials, which must be ground and mixed to create the natural paint, acrylic paint was used. The colors of acrylic are much brighter than the original natural colors used by ancient Aborigines. The acrylics contrast (stand out) very well against the stained and varnished wooden background of the boomerang. Today, even the most traditional artists use the more convenient, durable, and bright acrylic paint to create artwork for tourists. The traditional style of the paintings remains the same, despite the modern paint. Boomerangs were only used in a few areas of Australia, although some tribes might trade for one because they admired the look of the art. A boomerang could be deadly to an animal if it is thrown correctly. 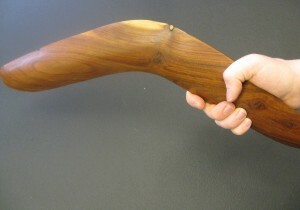 The boomerang remains a symbol of Australia. 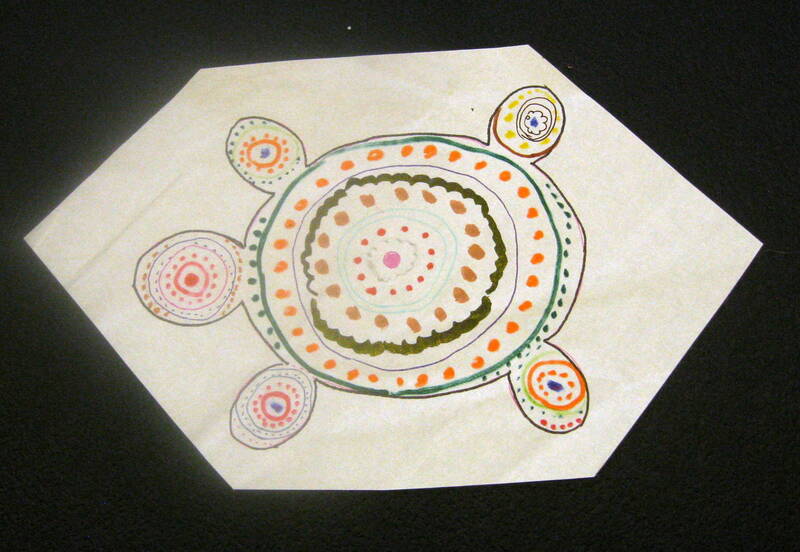 What type of PATTERN did the Artist use to paint the Turtle—Lines or Points (Dots)? This important sculptural display was commissioned by the Australian National Gallery to mark the 200th anniversary of European settlement on Australia, which was in 1988. Two hundred carved and painted wooden poles were mounted on a white base to represent each year of European settlement on the Continent of Australia. In Central and Eastern Arnhem Land, this original type of simple pole sculpture had a minimum of carving, but was elaborately painted with designs belonging to the clan of the artist. The sculptors and painters were men who had participated in special ceremonies and so were entitled to depict the secret-sacred stories of the dreaming on the poles. Painting was done with earth colors—red ochre, black manganese or charcoal, and white obtained from either Australian pipeclay or the mineral huntites. Today, these natural earth colors are still used by Aborigine artists but the paint materials are often mixed with a commercial adhesive to ensure durability that is more lasting. 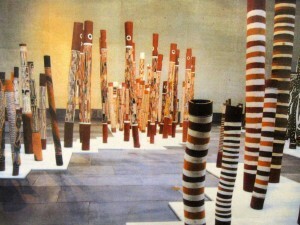 The original use of these decorated poles was to commemorate or memorialize the graves of many groups of Australian Aborigines. Originally, simple decorated living tree trunks were used for this purpose. Eventually, hardwood poles were cut from trees to be carved and painted. (Probably because this was more conveniently portable and trees are not plentiful in every area.) Towards the end of the funeral ceremonies, these carved and painted poles were (and still are) erected around the grave by the mourners. The decorated poles would be left to weather and decay naturally. The final home of the spirit of the dead varies widely across Aboriginal groups. Some tribes believe that the spirits return to the boulders from which they originated. Other tribes believe that their spirits go back to their mythical tribal country, and follow a way of life similar to that which they knew on earth. Still others believe that dead spirits travel to distant islands where living conditions are ideal and perfect. In a few tribes, it is believed the spirit simply ceases to exist after death. The use of his/her name is forbidden and all memory of them disappears. 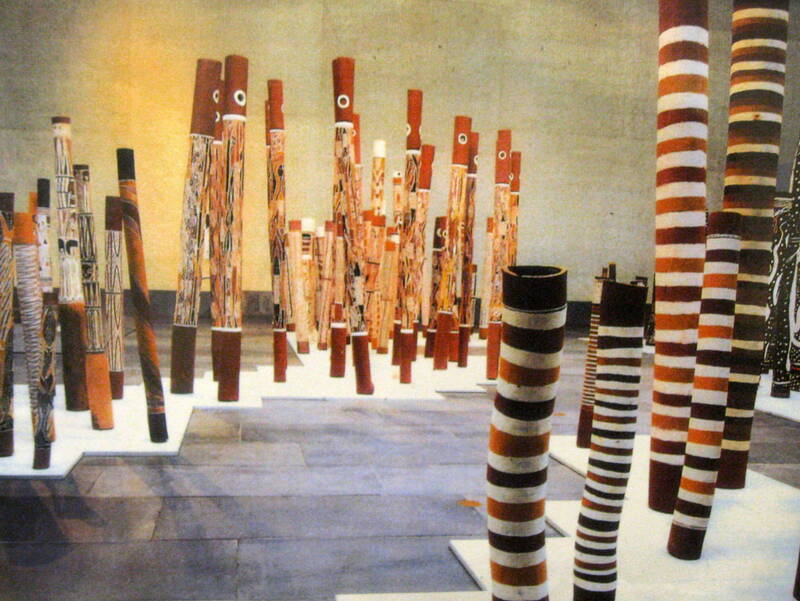 Why do you think the Australian National Gallery chose to use Aboriginal burial poles to commemorate the Anniversary of the European settlement of Australia? When a pole leans to one side or has a slight curve, the artwork is unique and more interesting. Use wrapping paper, paper towel, or toilet tissue tubes to paint a memorial pole. These can be better displayed by attaching a small square of foam core board with hot glue (Kids should not use hot glue gun). Undercoat tube with white paint. 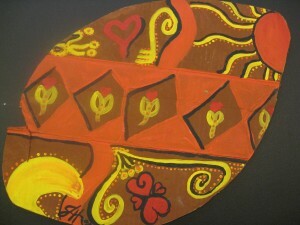 Paint with either traditional colors or modern acrylic paints to paint a variety of patterns and colors. Tempera will work nicely. Strips of poster board can be painted with pattern, then glued, to create a larger or thicker burial pole. Black, white and primary colored backgrounds will each create very different effects. You may wish to choose 2-3 different colors of poster board, plus white and black, for more classroom variety. Cut strips ahead.